Monday’s latest episode of 24: Live Another Day on Fox at 9pm is the highlight of the week once again as the traditional television season runs its course and we start to see the arrival of the summer programming. Three hours into season nine and 24: Live Another Day has already joined Game of Thrones as ‘event’ programming that overshadows the rest of the week. Kiefer Sutherland and Mary Lynn Rajskub excel as Jack Bauer and Chloe O’Brian in a very solid production that has used London locations well. However it is Michael Wincott’s Adrian Cross that continues to be the character I’m most interested in, as we appear to have only just scratched the surface as to his motivations and machinations. A suspiciously easy tracking down of a fellow hacker has been followed by a blatant double-cross that almost gets Bauer caught by the US authorities. My only complaint, and it is a minor one, is that with 12 hours of programming rather than 24 there wasn’t enough time to do a little more of a slow burn with the initial betrayal. And I say initial, because there’s more coming I’m sure. Meanwhile Yvonne Strahovski’s extremely competent CIA Agent Kate Morgan is the type of character that screams ‘spin-off’ and it is to be hoped that the relevant parties are considering not only more 24, but also a series based around Strahovski. 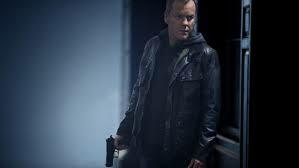 Fans of twitter can keep track of the crew and cast of 24: Live Another Day via a twitter list that I have created. Thursday it’s TiVo time as Fox and the CW both roll out shows of interest. The latter with Labyrinth, a four hour, two-day mini-series at 8pm that concludes on Friday at the same time, is based on the best-selling novel by Kate Mosse. A German-South African production the show originally aired on Canadian television, along with multiple other markets, in 2012 and Channel 4 in the UK last year. The book, which given the subject matter it is surprising that I have not yet read, is the story of two woman separated by 800 years and their mutual search for the Holy Grail. There’s the old cliché about how movies and television are never as good as the book so in this case I’m happy to have overlooked such an international best seller. Vanessa Kirby, who has that look that says you’ve seen her in something before even if you can’t remember what, and Jessica Brown Findlay best known for her work on Downton Abbey play the modern and High Middle Ages protagonists. One hour later on Fox, so you have time to figure out if Labyrinth is worth the further time investment, sees the premiere episode of Gang Related. An action-drama that revolves around the Los Angeles Police Department’s elite Gang Task Force and specifically Ryan Lopez who with ties to a local gang has essentially one foot in each camp. I like the tag line of ‘Every hero has a dark side and every villain has a heroic side,’ and am curious to see how that plays out. Ramon Rodriguez who played Renaldo on The Wire, gets the plum role of Lopez and the biggest question will be how much Fox has invested in a Summer show?